Still with the $20 price sticker! Look at the pristine striped interior! The piece covering the machine is a piece that comes off so you have a free arm to work with -- great for doing things like leg or arm seams. Still in the box, but looking good, quite clean and well-cared for! I'd been told that Vikings are one of the best (if not the best) sewing machines around however new ones are cost prohibitive, and vintage ones are pretty pricey as well. 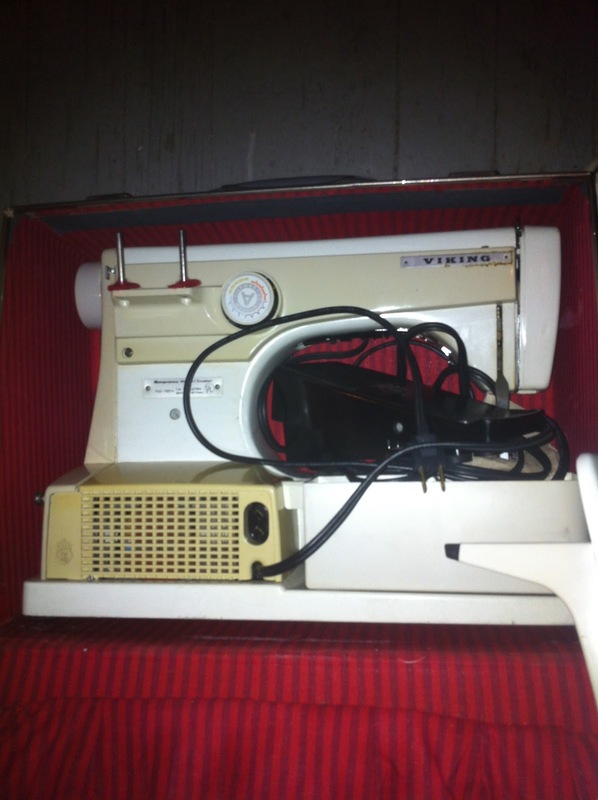 After sleuthing a little on eBay I found one a bit newer to mine (just by a little, model 6030, mine is a 6020) had manuals as well as cams A-D (a "cam" is the piece you insert to get different stitches on older machines, new machines just have a dial you switch to and it will sew in that stitch) like mine, sold last week for $281.85 plus $37.07 shipping (these suckers are HEAVY nearly all metal!) But others without the case or any manuals, and only one cam sold for $49.99 to $75.00. 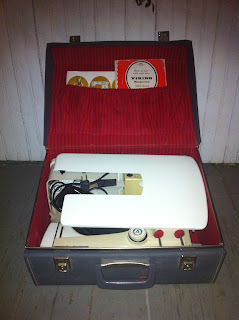 This week there are more active listings and the prices are all over, going from $30.00 to $249.99. (There is one I found amusing because one of the booklets has the date of 28 Dec 1973, a day before my husband's birthday! How bizarre to find two manuals with dates so close to me and my husbands birthdays!) So I'm not really sure what mine is worth... as I used to say when I had the flea market biz "it's only worth as much as someone will pay for it!" To me, its still a steal as a working machine for $20 is pretty damn good, especially one that has so many of its original components. The booklets that were included. 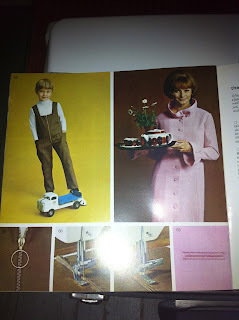 At look at the fashions in the "For Fashion or Fun" booklet. The only thing it looks like I might have to fork over some cash for is if I want a different presser foot (or possibly "feet" should I need more which are used for different stitches) and cams E-K if the stitches they create of use to me. All these little parts add up quickly, so if I do need extras I'm hoping to run across bulk lots to keep the prices down. Who knows, I haven't even taken it out of the case yet to play, so there may very well be more presser feet hiding in there somewhere, now wouldn't that be a nice surprise? Wow, what a find. My boss have been buying old Berninas on ebay for our costume shop, they've been running over $100. You got an awesome deal! I have one of these machines, they are great! There is a knob on the right side where you wind the bobbin. Pull it out. It now goes VERY slow. 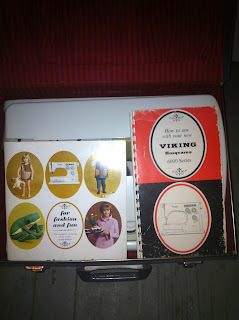 this is the viking low gear. lots of power that way. What an awesome find! That machine looks like it's in excellent condition. And the price...what a deal!